The mechanism of pain production remains controversial. One theory suggests that peripheral injury or disease of the trigeminal nerve increases afferent firing in the nerve; failure of central inhibitory mechanisms may be involved as well. Pain is perceived when nociceptive neurons in a trigeminal nucleus involve thalamic relay neurons. An abnormal vascular course of the superior cerebellar artery is often cited as the cause, as well as other small arteries or veins compressing the facial nerve. In about 85% of cases, no lesion is identified, even after extensive investigations, and the etiology is labeled idiopathic (classic) by default. Aneurysms, tumors, chronic meningeal inflammation, or other lesions may irritate trigeminal nerve roots along the pons, causing symptomatic trigeminal neuralgia. Uncommonly, an area of demyelination from multiple sclerosis may be the precipitant. Lesions of the entry zone of the trigeminal roots within the pons may cause a similar pain syndrome. 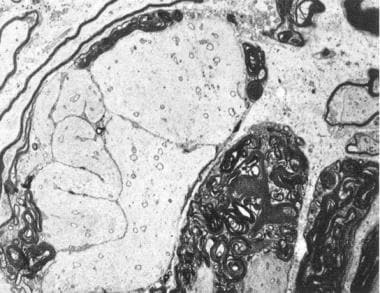 An area of demyelination is shown in the image below. Microscopic demonstration of demyelination in primary trigeminal neuralgia. A tortuous axon is surrounded by abnormally discontinuous myelin. Electron microscope, 3, 300 X.
Trigeminal neuralgia (TN) is uncommon, with an estimated prevalence of 155 cases per million persons. No mortality is associated with idiopathic trigeminal neuralgia (TN), although secondary depression is common if a chronic pain syndrome evolves. In rare cases, pain may be so frequent that oral nutrition is impaired. In symptomatic or secondary trigeminal neuralgia, morbidity or mortality relates to the underlying cause of the pain syndrome. Development of trigeminal neuralgia in a young person suggests the possibility of multiple sclerosis. Idiopathic trigeminal neuralgia typically occurs in patients in the sixth decade of life, but it may occur at any age. Symptomatic or secondary trigeminal neuralgia tends to occur in younger patients. [Guideline] Cruccu G, Gronseth G, Alksne J, et al. AAN-EFNS guidelines on trigeminal neuralgia management. Eur J Neurol. 2008 Oct. 15(10):1013-28. [Medline]. Cheshire WP Jr. The shocking tooth about trigeminal neuralgia. N Engl J Med. 2000 Jun 29. 342(26):2003. [Medline]. Cheshire WP Jr, Wharen RE Jr. Trigeminal neuralgia in a patient with spontaneous intracranial hypotension. Headache. 2009 May. 49(5):770-3. [Medline]. Gronseth G, Cruccu G, Alksne J, Argoff C, Brainin M, Burchiel K, et al. Practice parameter: the diagnostic evaluation and treatment of trigeminal neuralgia (an evidence-based review): report of the Quality Standards Subcommittee of the American Academy of Neurology and the European Federation of Neurological Societies. Neurology. 2008 Oct 7. 71(15):1183-90. [Medline]. Cheshire WP. Fosphenytoin: an intravenous option for the management of acute trigeminal neuralgia crisis. J Pain Symptom Manage. 2001 Jun. 21 (6):506-10. [Medline]. Vargas A, Thomas K. Intravenous fosphenytoin for acute exacerbation of trigeminal neuralgia: case report and literature review. Ther Adv Neurol Disord. 2015 Jul. 8 (4):187-8. [Medline]. Knafo H, Kenny B, Mathieu D. Trigeminal neuralgia: outcomes after gamma knife radiosurgery. Can J Neurol Sci. 2009 Jan. 36(1):78-82. [Medline]. Niki Y, Kanai A, Hoshi K, Okamoto H. Immediate Analgesic Effect of 8% Lidocaine Applied to the Oral Mucosa in Patients with Trigeminal Neuralgia. Pain Med. 2014 Feb 7. [Medline]. Zhang J, Yang M, Zhou M, He L, Chen N, Zakrzewska JM. Non-antiepileptic drugs for trigeminal neuralgia. Cochrane Database Syst Rev. 2013 Dec 3. 12:CD004029. [Medline]. Bennetto L, Patel NK, Fuller G. Trigeminal neuralgia and its management. BMJ. 2007 Jan 27. 334(7586):201-5. [Medline]. Chole R, Patil R, Degwekar SS, Bhowate RR. Drug treatment of trigeminal neuralgia: a systematic review of the literature. J Oral Maxillofac Surg. 2007 Jan. 65(1):40-5. [Medline]. Gomez-Arguelles JM, Dorado R, Sepulveda JM, Herrera A, Arrojo FG, Aragon E, et al. Oxcarbazepine monotherapy in carbamazepine-unresponsive trigeminal neuralgia. J Clin Neurosci. 2008 May. 15(5):516-9. [Medline]. MRI with high resolution on the pons demonstrating the trigeminal nerve root. In this case, the patient with trigeminal neuralgia has undergone gamma-knife therapy, and the left-sided treated nerve (arrow) is enhanced by gadolinium.